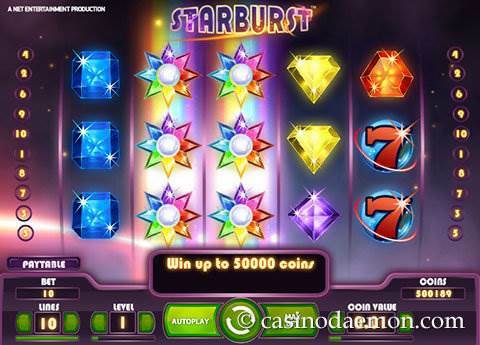 Starburst is one of the most popular Netent slots on the Internet. The special feature of this game is that wins are counted both ways, and there is an additional Starburst-Wild to help you win even more. Game pace is fast and thrilling. With lots of free re-spins, and an exciting atmosphere, this game will surely entertain you for a long time. The variance of the game is low to medium, as you won't have a win in every round and most money can be won in the re-spins with more than one wild symbol. The theoretical return to player is 96.1%, which is average for an online slot. You can win up to 50.000 coins in one spin. 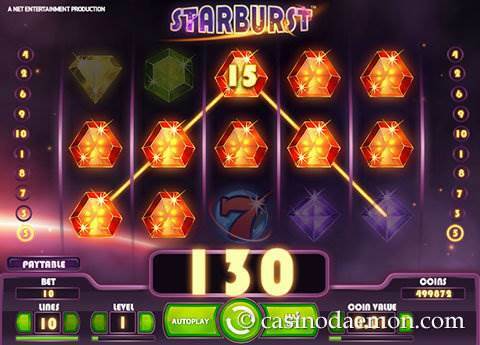 Starburst is also available in the Netent Touch selection of games for mobile devices. You can play this popular game on iOS and Android devices. 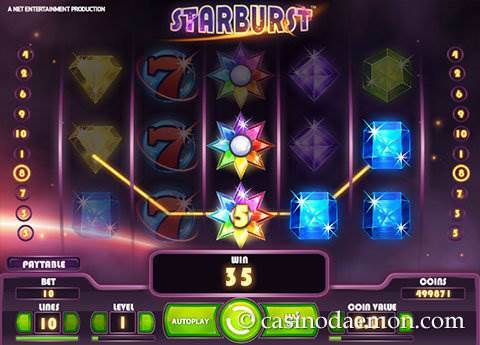 You can try out the popular Starburst slot for free here and see for yourself why the game is so popular. If you would like to try your luck for real money you can find the game in one of the online casinos listed on this page. 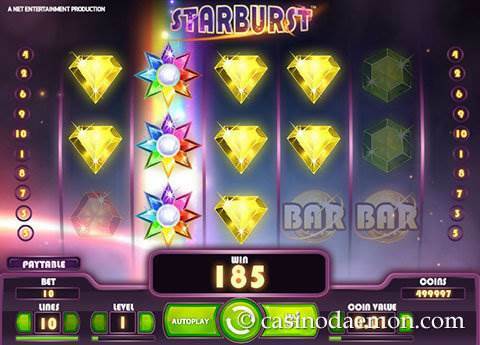 Starburst is a slot game full of jewels in different colours and different shapes. You will come to love one particular jewel the most though: the Starburst wild. This rainbow coloured Star symbol can appear on reels 2, 3 and 4, and it substitutes for all other symbols to create winning combinations. Both ways! And even better, it also expands over the whole reel, giving you plenty of chances to win, and it awards you with up to 3 free re-spins! In the best case scenario, you get a wild on each reel, spread over 3 rounds, giving you 3 full reels of wilds. Big winnings are guaranteed! The maximum line win in one way is 250 coins with the Bar symbol, which effectively means 500 coins, because when you have 5 symbols on an active pay line it counts double. This may not be a huge single win, but the game actually pays out very often, mostly smaller wins, but they come regular, and sometimes there is a big win as well. Starburst has 5 reels and 10 pay lines. You can select how many lines you play in each spin, but we recommend playing them all for better chances of winning. The minimum coin value is 0.01 £/€/$, and the maximum is 1 £/€/$. There are also 10 bet levels that can multiply your wager. To play the slot, you have to wager at least 0.01 £/€/$, or any other amount, of up to 100 £/€/$. When you've made your selection, just press the big green spin button in the middle to start the game. With the automatic play settings you can lean back and relax, while watching the game.